The Marine Corps has a long and storied history of partnering, mentoring, and advising foreign militaries. Marines served as the officer corps of the Gendarmerie d’Haiti and integrated at platoon-level with South Vietnamese Popular Forces. These are only two of many possible examples, but they suffice to illustrate the diversity of relevant Marine Corps experience. This enduring legacy influences Marine counterinsurgency operations in Afghanistan as well as theater security cooperation exercises throughout the world. 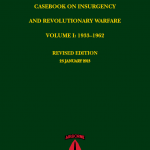 Studying past combat helps gain insight into how insurgents may operate in the future. 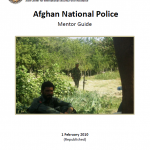 This guide uses short, simple vignettes to highlight common Afghan insurgent tactics. Each vignette focuses on a particular mission profile, such as raids, ambushes, and defending against a cordon and search. While tactics are continually evolving, the Afghans have a well documented history of using similar techniques against foreign militaries. Most of the vignettes in this guide are from the 1980s when Afghan insurgents fought the Soviet Union. Despite being more than 20 years old, many of the tactics remain in use today. For a more complete description of Afghan insurgent tactics against the Soviets, MCIA strongly recommends reading The Other Side of the Mountain by Ali Jalali and Les Grau, which this guide is based on. The final three vignettes in this guide are from recent operations in Afghanistan and demonstrate the evolution of tactics, techniques, and procedures (TTPs) by Afghan insurgents. Several basic training manuals used by U.S. forces to train the Afghan National Army (ANA) from 2007-2009. To effectively defeat an enemy, one must first understand the enemy. Intelligence professionals have forgotten the basic principles on which intelligence analysis is conducted, instead they sub-scribe to the paradigm that the enemy faced in this Global War on Terror has no structure or doctrine. Any organization, military or civilian, must have a structure and a way of doing business if they are to have any chance of being successful. The purpose of this document is to outline the role of female engagement on the ground and best uses of female engagement initiatives. 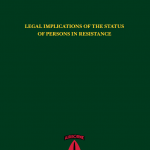 While existing academic literature on females in Afghanistan is limited mostly to the urban areas, it is evident that the lives of women in rural Helmand are complex and difficult than is generally understood from open source and academic literature. Female engagement encompasses methodical, long-term outreach efforts to the entire population, men, women, and children, which is essential in a counterinsurgency. Such engagement efforts provide opportunities to connect with both men and women, counter negative Taliban IO efforts, and improve civil affairs efforts. Complex operations often require the development of specialized teams with multidisciplinary perspectives. Examples of these groups include human terrain teams, provincial reconstruction teams, and, most recently, female engagement teams (FETs). These specialized programs are tasked with engaging local populations to ascertain information on civil-society needs and problems; address security concerns; and to form links between the populace, military, and interagency partners. A U.S. military training program designed to enhance soldiers’ abilities to operate in irregular conflicts includes exercises which encourage soldiers to think like terrorists in order to examine opposing ideologies. The exercises are part of a course designed to help trainees with practical decision-making skills in “irregular conflicts” and counterinsurgency called Combat Observation and Decision-making in Irregular and Ambiguous Conflicts (CODIAC). The course was initially created in 2010 as a way of enhancing the “ability of individuals and small teams to address irregular challenges by training enhanced observation, battlefield sensemaking, human terrain pattern recognition, and environmental analysis (including knowledge of combat tracking).” The CODIAC course incorporates curriculum from a number of other military programs, including the U.S. Marine Corps’ Combat Hunter program, and it is designed to primarily for military personnel as well as “interagency paramilitary personnel, such as Border Patrol or Police Officers, as well as multinational allies.” The course focuses on a number of core subject areas related to decision making, intelligence and observation, physical tracking and “human terrain” analysis.